Home / Dissent NewsWire / At Long Last, Have You No Sense of Decency? At Long Last, Have You No Sense of Decency? Sixty-two years ago today one of our nation’s most infamous demagogues had his career come to a symbolic end. Sen. Joseph McCarthy, whose name has now become synonymous with political persecution, rose from a relatively unremarkable junior Senator to a national figure by claiming to have knowledge of widespread Communist infiltration in the US government. However, McCarthy’s quick rise to acclaim was met with an even swifter fall. In January 1954, 50% of Americans had a positive opinion of McCarthy. By June of that same year, only 34% did. What happened? Popular histories of the rise and fall of the Wisconsin fearmonger attribute this to a single event. Like most major shifts, there were probably multiple factors in play, but this moment has burned a mark into our historic conscience. While McCarthy had been claiming Communist infiltration in the government, in 1954 the US Army accused McCarthy of asking for special favors for a former aide and friend. In true McCarthy style, McCarthy claimed the accusation was part of a plot to retaliate against him for investigating communism in the military. A three-month series of hearings (“the Army-McCarthy hearings”) ensued. These hearings were broadcast live “gavel to gavel” on TV, a first for any Congressional hearing, with an estimated audience of twenty million Americans. Senator, may we not drop this? We know he belonged to the Lawyers’ Guild[….] Let us not assassinate this lad further, Senator. You’ve done enough. Have you no sense of decency, sir, at long last? Have you left no sense of decency? McCarthy, not knowing when to quit, tried to launch into the issue a third time, receiving yet another passionate retort from Welch. When Welch said “ Mr. McCarthy, I will not discuss this further with you […] I will not discuss it further. I will not ask, Mr. Cohn, any more witnesses. You, Mr. Chairman, may, if you will, call the next witness.” The gallery erupted in applause. The line “have you no sense of decency” has come to be identified as the moment that ended McCarthy’s career once and for all. It important to remember though, that while McCarthyism has become the term used to describe the climate of political repression during the Second Red Scare (and now political repression generally), McCarthyism did not begin nor end with McCarthy. The climate of political intimidation and fear was already in place, based on reckless claims that Communists had infiltrated the State Department and other government positions. McCarthy was merely tapping into these fears. 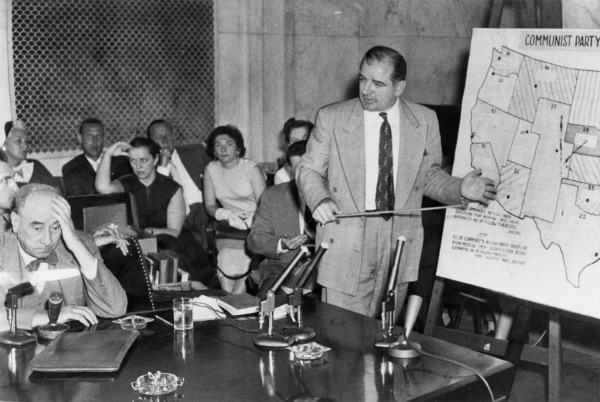 After McCarthy, McCarthyism most often brings to mind the House Un-American Activities Committee (HUAC), despite McCarthy having no direct involvement with the committee. HUAC was founded in 1938 and abolished in 1975. Before HUAC, there was J. Edgar Hoover and the FBI. Hoover got his start as head of the Department of Justice’s “Radical Division,” which infamously was behind the Palmer Raids. When the Radical Division became the FBI they continued to make it one of their top priorities to police dissent. This included both the FBI’s “Security Index,” which ran from 1938 to 1978 and its infamous COINTELPRO which ran from 1956 to 1971. And, of course, while Hoover is dead the FBI still exists today and still policies dissent. The name McCarthy has been bandied about quite a bit this week. Not in reference to the anniversary of his downfall, but in reference to an Executive Order from New York Governor Andrew Cuomo creating a blacklist of companies that support the Boycotts, Divestment, and Sanctions movement and ordering New York to divest from such companies. The Bill of Rights Defense Committee/Defending Dissent Foundation (BORDC/DDF), has opposed efforts to enact similar measures via proposed legislation in numerous states and wasted no time in sending Cuomo a letter explaining in myriad ways in which the Order bill is unconstitutional. McCarthyism was a deliberate attempt to reign in progressive movements, like the labor, civil rights, and peace movements, who seemed to be gaining power. McCarthyism was not just about censoring political ideas, but chilling speech broadly by making examples of those with political heterodoxies by promoting their complete alienation from civil society. McCarthyism did not just seek to ban books about Marx, but make sure those with the wrong political views could not find public or private employment, receive certain government benefits, or be issued passports. Subversive organizations were barred from renting hotels. The attacks on the Palestinian human rights movement are McCarthyist in nature […] the attacks are a response to the growing strength of a progressive social movement. Additionally, while they do seek to censor ideas they disapprove of they often go much further. Many hope to create permanent blacklists. It is hard to imagine any of the many demagogic or anti-civil libertarian figures prevalent in today’s culture withering away into ignominy at the mere questioning of their decency. Yet, perhaps we should take the anniversary to ask once again if such figures have any decency remaining. While there are many candidates worthy of our admonition, given that he has made the rounds in the media as modern-day McCarthy perhaps we should start with Gov. Cuomo. * The author of this piece was not only a member of the National Lawyers Guild in law school, he was co-director of his student chapter, and remains an extremely proud member of the Guild to this day.